Snow cover in Spring promotes the development of advection fogs when relatively moist air moves over the snowpack and is cooled to its dewpoint, saturating. But snowcover is also white when viewed from Satellite, and its presence makes the detection of fog areas difficult. There are several products that can be used to distinguish between white snow and white clouds, and products that can be used to refine further the difference between stratus decks and fogbanks. 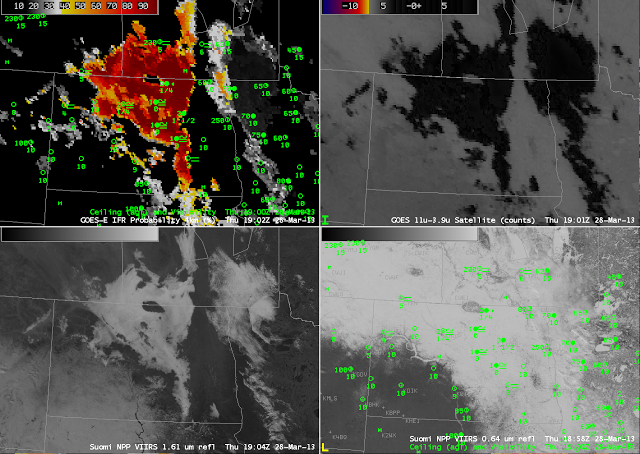 In the imagery above, Suomi/NPP 1-km resolution visible (0.64 µm) data in the bottom right figure show a large region of both clouds and snow over the North Dakota and surrounding US States and Canadian Provinces. It is very difficult to find the cloud edges that are there. The 1.61 µm imagery from Suomi/NPP is very helpful in screening out imagery of snow on the ground. Water clouds are far more effective at reflecting radiation at wavelengths around 1.61 µm than snow or ice (snow and ice both strongly absorb radiation at that wavelength). Thus, in the bottom left figure, the 1.61 µm reflectivity detected by Suomi/NPP, areas of snow appear dark and areas of water-based clouds are white. This tells you where water clouds exist, but nothing about how high above the surface those water clouds are. The brightness temperature difference product from GOES (10.7 µm – 3.9 µm) also highlights in dark regions of water-based clouds, but as with the 1.61 µm reflectivity does not give information about cloud bases. This entry was posted in Northern Plains, Snow, Suomi/NPP on March 28, 2013 by Scott Lindstrom. GOES-R IFR Probabilities showed values around 20-25% over the fresh snow cover in south-central Virginia in the Piedmont. Why? The GOES-R cloud mask sometimes detects clouds where fresh snowfall is present, as shown in the GOES-R Cloud Type product above, especially if the snow mask is not up to date. The GOES-R cloud type product determines the phase of any pixel detected as cloud by the cloud mask; clouds were detected, albeit incorrectly, in this area and classified as water clouds. It is unlikely that clouds are present over south-central Virginia because the brightness temperature difference product suggests no water-based clouds in this region — the white areas in the visible over southern Virginia and northern North Carolina have a signature in the 2.2 µm channel (lower right in the 4-panel image) that is strongly indicative of snow on the ground (snow strongly absorbs radiation at that wavelength, so little energy is reflected back to the satellite). The GOES-R FLS product is dependent upon the GOES-R cloud mask during the day and calculates the probability that IFR conditions are present for any detected cloudy pixel. The presence of clouds in the Cloud Type product for reasons stated above leads to the calculation of an IFR probability where clear sky is likely present. Although the IFR probabilities are higher over the fresh snow than in other clear sky areas, the probabilities are relatively low, around 20-25%. Probabilities in this range should give forecasters low confidence that IFR conditions are present in this area. Conversely, the small region of relatively high IFR probabilities (>50%) in southwest Virginia — near Wakefield — and extreme southwest Virginia — near Wise — correlates well with a region of eroding IFR conditions. Note that cloud ceilings over the mountains of far western Virginia are very close to or below IFR criteria, giving forecasters higher confidence that IFR conditions are present. 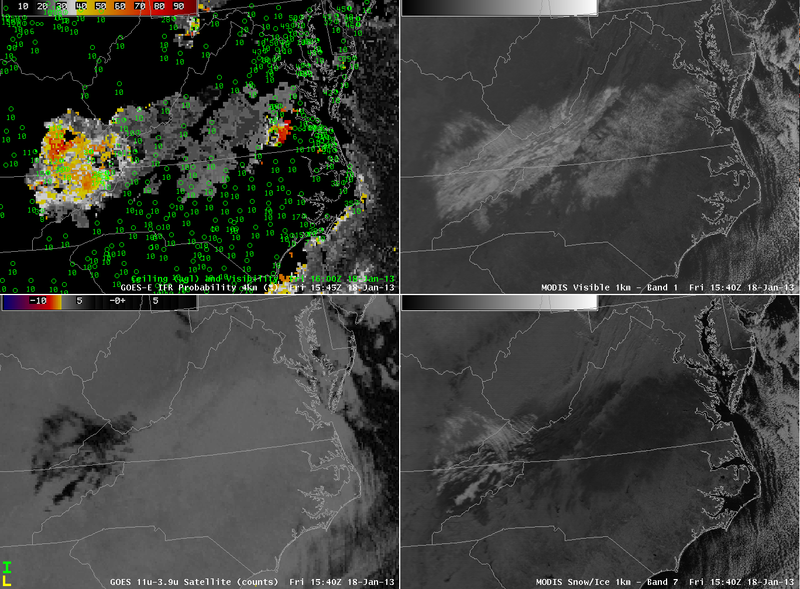 The Visible imagery above shows generally clear skies over central Virginia, with some cloud streets developing later in the afternoon. The eroding IFR cloud deck over extreme SW Virginia is difficult to see in visible imagery alone but is evident by the dissipating clouds in western Kentucky. This entry was posted in Appalachia, Error Explanations, Mid-Atlantic, Snow on January 18, 2013 by Scott Lindstrom.